A closer look at the narrow range shows a well-established horizontal boundary (shown in green) with consolidating volume. 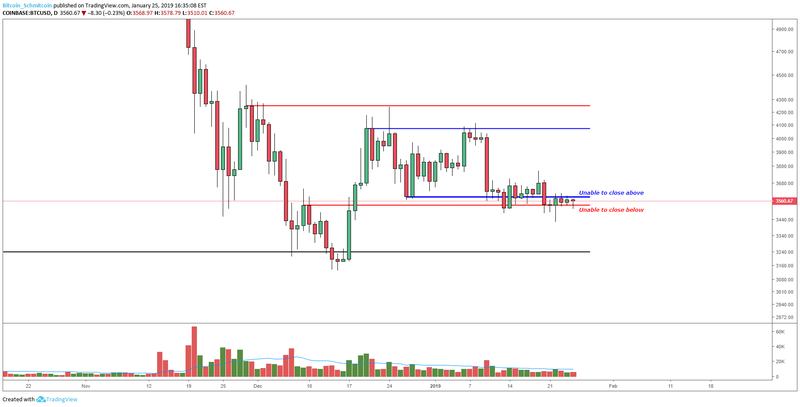 The one and only candle that breached the lower boundary of the range occured on low volume and was immediately rejected on relatively strong demand pressure. The consolidating volume and tight, narrow spread at the lower boundary of the trading range is often a sign accumulation is taking place. However, it should be noted that these low volume/low liquidity conditions make it fairly difficult to read trading ranges. If we manage to close above the green trading range, we can expect to see a test of the upper, macro range (upper blue line). From there we will have to reassess and see if we can close above that level. However, if we pop a new low and close below the current, green trading range, that would likely yield a shove to retest prior lows in lower $3,000s. For now, we are currently tightly coiled and ready for the next big move. Due to the low volume/low liquidity conditions, the volatility is high and it is advisable to wait for a daily close to gain a more objective standpoint of the market conditions. A tightly bound market has the market ping-ponging within a $200 range over the last week. There is a decent argument for an accumulation range on low time frames, but the markets are highly volatile so its best to wait for the daily signals for a stronger view of the market. Because the market is so tightly bound between support and resistance levels, a close below or above the outlined levels will likely yield a strong continuation in the direction of the breakout.